If you like what you read, please tell your friends! I was born a Strong. I'm the oldest of ten kids. It's a fun place to be. You get to be in charge and I love to be in charge, just ask any of my siblings. (However, the older I get the more willing I am to pass it on to someone else.) Being the oldest means I am the one lucky kid who actually got to be an only child although my youngest brother, who is 23 1/2 years younger than me and a senior in high school, is for all intents and purposes more like an only child than I ever was. My younger sister came into our family just 18 months after me and there was another child every one to two years after that until I was 12. My Mom had 8 kids in 12 years. That is amazing! She is amazing but she still had two more kids to go. She had my youngest sister about 5 years later and my youngest brother another 5 years after that. In total, I have 3 brothers and 6 sisters. There are not many people who can even imagine what it might be like to grow up in a family like that so I'd like to share a bit of it with you. Growing up in a large family means you have to be loud to be heard. We are all loud. Some of us are loud when we need to be and some of us are stuck at a very loud decibel all the time but we all make sure our voice is heard. We tend to talk over one another and although most people have a hard time following our conversations, somehow we know what others have said even if we have talked right over them. When we get together, our neighbors know and our neighbors' neighbors know. If you have nine siblings, you always have a playmate. There's always someone to talk to or play with or hang out with. You never have to arrange a playdate with anyone and you probably won't ever get one because there's too many other things for your mother to do but you never have to worry about being lonely. Of course, if you ever want some alone time it usually has to happen in the bathroom, with the door securely locked. Growing up in a large family means you learn to eat fast. If the food is good and you want seconds, you eat fast or it will all be gone. There's not much dinner conversation unless it's around the food in your mouth. You learn to ask how many can you have and you eat those quickly just in case there's any left over. As the oldest child in a large family, you learn to be a good mediator, dictator, briber, orator, commander, director, litigator and a multitude of other -er and -or words. It's a skill that has come in quite handy as a teacher, a community board member, a PTA member, a church youth group leader, etc. Plus, these skills have been invaluable as a mother of five. When you live with nine siblings there are always surprises, and they're not always good ones. I remember the spring break I brought my roommate home from college and my sisters were up extra early getting ready for school. We were all sleeping in the family room as there wasn't a guest room for us. (With nine kids, once you move away to college you never come back home to stay permanently because your bed gets taken up immediately.) There was a meltdown because some sister "borrowed" someone else's article of clothing. Some rather shrewish screaming ensued and we were all woken up. I rolled over on the couch and looked at the very shocked look on my roommate's face and I could have laughed. After the girls finally got off to school, she asked me if every morning was like this. I think I did laugh then. No, every morning was not like that but it happened. Nine siblings keeps you on your toes. Growing up in a large family means there's always a lot of work to do. As a child, I felt we spent an inordinate amount of time cleaning but now as an adult I realize we only did enough cleaning to keep my mom sane. I remember the dash we would make to clean the house right before we knew she would be home from work. Since my father got home first, he would be yelling in the background to get us to move faster. He didn't want her to come home and see how we had been living all afternoon. Family vacations with ten children are simple but they were a magical time for me. We would visit my grandparents cabin in Idaho every summer. I realize now we couldn't afford to go anywhere else but quite frankly, I didn't think there was any other place to go that was as wonderful as the cabin. Our family would spend a couple of weeks at the cabin each summer playing outside and visiting with cousins and other family members. We would go rafting, canoeing, walking, hiking, ride bikes and go fishing with whichever grandpa was brave enough, or crazy enough, to take us. We took many long rides in our orange Volkswagen bus to explore the countryside. I learned later this was to give my grandparents a break from all of us. We also spent a lot of time in Yellowstone. It was an ideal way for a kid to vacation. In a large family, you learn to be responsible for other human beings. I was almost always given charge of a younger sibling. I had to help them with everything from getting dressed, to helping them with their homework, to keeping track of them when we went somewhere. You almost always were responsible for someone other than just yourself. Growing up in a big family means you have no personal space or personal business. Everyone is involved in everything you do whether you want them to be or not. Everyone has an opinion and in the Strong household, everyone felt they needed to share theirs. Not much has changed since we've gotten older but we are better at listening to one another. There's a lot less yelling and hurt feelings than there used to be! The upside of all this is that when something bad happens, you have 11 other people that are there for you cheering you on to greatness. These are only a few examples of what it was like to grow up in a large family. I loved it. I'm now the mother of five children and I don't know how my mother did it. I remember as a kid that women would ask me how my mother did it. I didn't know, she just did. Just a few years ago, I asked her how she did it. She says those years are all a bit cloudy. She just did what had to be done. She is amazing. Growing up in a household of ten children was amazing. I'd like to say I loved every minute of it but that would be stretching the truth way too much but it was ideal for me. I wouldn't have traded my life of craziness and crowdedness for my own room or new clothes. I look back with great fondness on my childhood but I think most of us do because for most of us it is a carefree time when life is good. Thanks for reading! 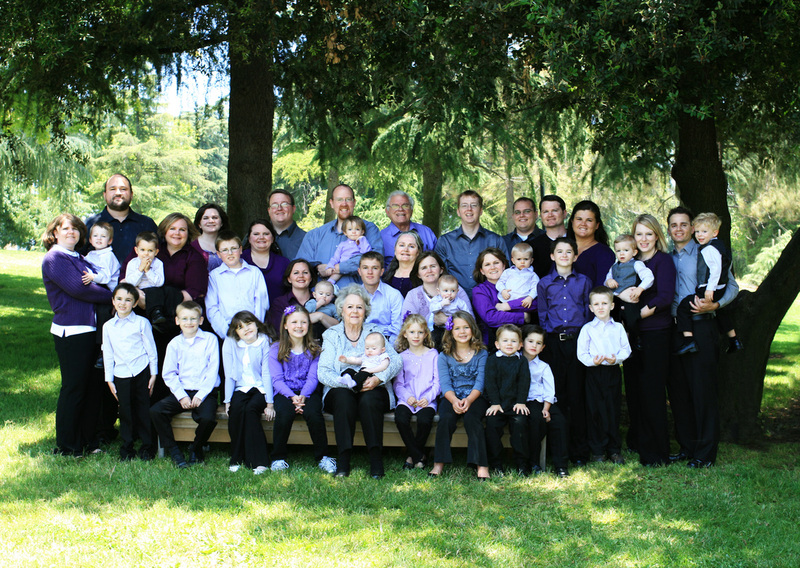 Below is the most recent picture of the entire Strong clan (June 2012). Five babies have been born since this picture was taken and 2 more are on the way!